When Three Gorges Dam goes fully online in China in 2009, after 17 years of construction, it will be 607 feet high and 1.4 miles long. Its reservoir will be 410 miles in length and 3,700 feet in width. It will be the largest dam on Earth, and probably the largest dam our planet will ever see. The dam’s reservoir will require the relocation of over 1.5 million people. 13 full-sized cities were leveled by the people who lived in them, brick by brick, to prevent the buildings from interfering with boat traffic. Some 1,300 archaeological sites will also be submerged. The dam also contributed to the extinction of the Yangtze river dolphin. The weight of the dam and reservoir can cause induced seismicity, or earthquakes. Over the fifteen days it took to initially fill the reservoir, there was a measurable wobble to the Earth’s spin. The first is to avoid floods. That’s the most crucial function. The second is to generate electricity. The third is to improve transportation. In 1954, the river flooded, killing 33,169 people and forcing 18,884,000 to relocate. The dam will prevent such events from occurring in the future. The dam’s 32 generators will produce 700,000 kW of electricity, with a total capacity of 22.4 million kW, which will reduce coal consumption by 31 million tons per year, cutting the emission of 100 million tons of greenhouse gas. In the educational video game, Civilization IV, the dam is a World Wonder, providing power to the entire continent. All of this comes at the astoundingly low price of 180 billion yuan ($25 billion dollars). So remember, when talking heads say humans are too tiny and insignificant to impact the environment, refer them to Three Gorges Dam, a project with many pros and cons that has literally made the Earth tremble. Edward Burtynsky, Manufactured Landscapes, 2006. Wikipedia Entry for Three Gorges Dam. Looks like it’s time to stop teaching Checks and Balances in American Social Studies since the Bush Administration has demonstrated that Congress and the Supreme Court have absolutely no power to oversee the Executive branch. Hey Everybody! It’s Another Global Cooling Report! I’m sure this one, unlike the last one and the one before that is for really real this time. Really. This one even made Digg, Drudge, Faux Noise, etc, etc… meaning it’s totally got legs for absolutely certain this time. Right? The total amount of cooling ranges from 0.65C up to 0.75C — a value large enough to wipe out most of the warming recorded over the past 100 years. All in one year’s time. DailyTech’s statement is completely nonsensical, and something only a dittohead could uncritically swallow. While I disagree strongly with his methods and reasoning, I do appreciate Anthony Watts’ urging his commenters “Don’t rush Science,” when they try to make some unsupportable leaps of logic to their conclusions. Where I take issue with Watts, is in his repeatedly saying “12 month period,” when he is, in fact, referring to a 13 month period. 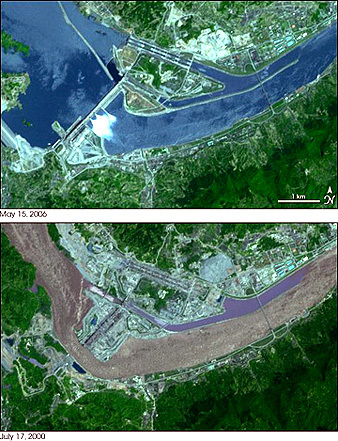 February 2007 to January 2008 would be 12 months, and would have returned a slightly less dramatic delta. This is important, because Watts has moved the field goals by one month to score a bigger talking point, but is framing it as a year to match the real science. As we can see on all the charts he provides, January 2007 was an unusually warm peak in global temperature and January 2008 was an unusually cold drop (although still above the mean). He then subtracts the extreme low from the extreme high, and… Voila! A global temperature drop. So… big whoop. There are highs and lows all over the chart, I could subtract any of the lower temperatures following 1998’s peak and claim a global temperature drop. Would that mean a Global Cooling trend, as the dittoheads (Not Watts) are claiming? No. That would just be more anecdotal evidence. The dittoheads are cherry-picking data out of the larger trend to support their claims. And what is that trend? 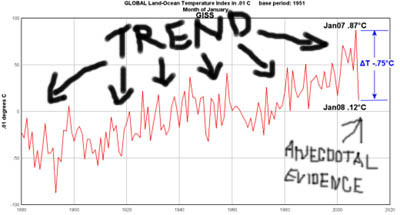 Even the briefest glance at HadCRUT’s, NASA’s, UAH’s, and RSS’s hard data plainly illustrates the trend, a steady, gradual increase in temperatures. Not anecdotal evidence from comparing two Januaries, but a trend encompassing more than a century of measurements in some cases. Even with a dramatic temperature drop over 13 months, 2007-plus-Jan08 is still an above average warm 13 month period. According to NASA’s GISS, 2007 tied for second warmest year on record, and according to the NOAA, 2007 was the fifth warmest worldwide, but then, they didn’t include January 2008, did they? Phil Plait, the Daily Kos, Misanthropic Principle, Climate Progress, and others have all posted responses to this latest bit of pure rhetoric, but I thought it important to throw my own critical explanation for why this latest dittohead attempt to subvert science was so disingenuous. The good news is that the Main-Stream Media wasn’t fooled for a second, which, of course, the Dittoheads took as evidence further validating their position, because we all know newspapers, news broadcasts, wikipedia, books, and scientists are all part of a vast librul conspiracy. I wish the “liberal” media was this sloppy and illogical, then they’d link to my blog as a reference. Maybe I should switch sides and blogwhore myself out to the dittoheads. It can’t be that difficult. Lobotomies are still legal, right? Billy Joel has written two of the most moving environmental songs ever, but they are not easily recognized as such. That’s because we are used to Environmentalism focusing on the non-human elements, such as the decline of other species and changes to the landscape, but environmentalism is ultimately about maintaining our human quality of life. Human stories like these are important to consider when special interests insist that environmentalism is bad for business, jobs, and our quality of life. All the politicians and military strategists were buzzing about China’s missile test in January 2007, where the country blew up one of its old satellites in orbit. After the debates about the diplomatic and militaristic implications of this demonstration had settled down, scientists took the opportunity to get on their soapboxes and complain about the real problem with China’s missile test, the fact that it put between 500 and 800 pieces of junk into Earth’s orbit. 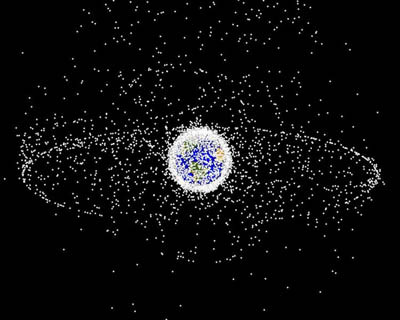 Each bit of space trash orbiting our planet is a potential hazard to satellites and future space travelers. The U.S. Space Surveillance Network currently tracks 13,000 pieces of space junk larger than four inches in diameter. This includes more than 2,000 spent rocket stages. Every time we launch something into orbit, we produce more space trash. There have been about 4,000 launches worldwide since the dawn of space flight. Space is junk-filled enough without our adding to the mix. The NASA Spaceguard programs is currently tracking 2,700 Near Earth Objects (NEOs), and adding more to the list every day. 700 of these are at least half a mile wide, big enough to cause global climate catastrophe were one to hit Earth. 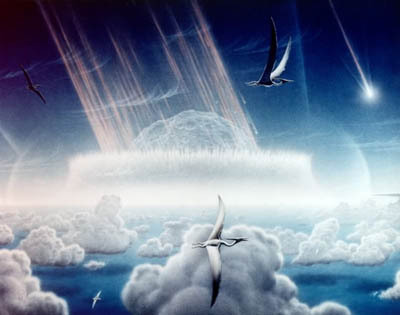 The Chicxulub crater in the Yucatan region of Mexico is the likely candidate for the asteroid that killed off the dinosaurs and 70 percent of all life on Earth. Some scientists theorize the impact vaporized carbonate rocks, releasing massive quantities of carbon dioxide into the atmosphere, and generating a dramatic greenhouse effect that shifted temperatures as much as 10 degrees. 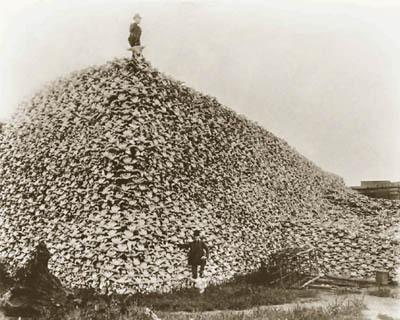 Other’s theorize the asteroid put enough dust and smoke into the atmosphere to block out the sun for up to six months, long enough to kill off most plant life and doom the entire food chain of animals relying on them. Whatever the mechanism, the impact was a climate shattering experience for planet Earth and traumatic to all life here. Six months after a repair mission to the Hubble telescope corrected the satellite’s focus, the human race was treated to the incredible sight of comet Shoemaker-Levy 9 colliding with Jupiter. The train of over twenty fragments produced a trail of black smudges in Jupiter’s atmosphere. When you consider the fact that 1300 Earths can fit inside this largest planet in our solar system, those smudges start to resemble bug splats on a windshield, as in that’s what would happen to our home world. Luckily, we have Jupiter’s magnificent mass to serve as the clean sweep for our solar system. Some scientists wonder if highly evolved life is even possible in solar systems that lack giant planets like Jupiter to reduce the amount of large debris floating throughout them. But having Jupiter doesn’t mean we can lower our guard. In addition to tracking NEO’s, scientists are formulating plans for how to deal with an asteroid on collision course with Earth, should we find one. Missiles are ineffective, because they would simply produce more debris; however, asteroid tugboats, solar sails, and attaching rocket boosters to asteroids are just some of the options we have on the table for nudging these rocks just enough to pass us by. The ability to escape off-world is another possibility, but only so long as we keep the space surrounding our planet free of debris. In April 1994, the space shuttle Endeavour took a ding on its window measuring a half-inch in diameter. This was caused by an orbiting paint chip. Anything much larger might have destroyed the shuttle and its crew, generating even more space debris. There is now so much junk orbiting our planet that some scientists fear we have reached a critical mass, and that collisions are now inevitable. Each collision would generate more debris, which generates more collisions, and a chain reaction occurs that fills our orbit with so much trash it would not only prevent us from venturing into space for a very long time, but also destroy weather and communications satellites with all the benefits they bring us as well. So while the Pentagon assures us no space debris poses a threat from their recent shoot-down of our own satellite, we do need to worry that the U.S. and China’s military demonstrations could bring about escalating weapons technologies in space, where even a small war would ground all humans on Earth for centuries. Are dittoheads trying to out-stupid each other? In it, he argues that Scientists and Environmentalists are being dishonest with their language by using the word “Carbon” in their arguments. That they should stop using terms like “post carbon energy future,” “carbon emissions,” “carbon footprint,” and “carbon sequestration,” because these terms are inaccurate, and they should instead replace “carbon” with “CO2,” which is more accurate. Ignoring the oxygen atoms and calling CO2 merely “carbon” makes about as much sense as ignoring the oxygen in water (H2O) and calling it “hydrogen.” That might be an effective PR tool for anti-hydro power campaigners but most people would regard such a communications trick as ridiculous. Equating carbon dioxide to “carbon” is no less flawed. 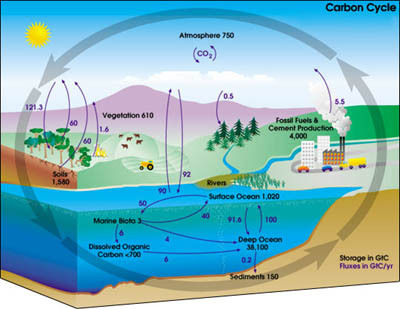 Carbon exists in the Earth’s atmosphere primarily as the gas carbon dioxide (CO2), and to a lesser extent methane (CH4) and chloroflorocarbons, all three of which are greenhouse gases, and the last, CFCs, are entirely anthropogenic in nature. Plants perform photosynthesis to convert carbon dioxide into carbohydrates. At the Earth’s poles, cooler seawater makes carbon dioxide more soluble, and it becomes carbonic acid. Sealife converts the carbon into shells made of calcium carbonate. The oceans contain around 36,000 gigatonnes of carbon, mostly in the form of bicarbonate ions. Carbon is released back into the atmosphere, where it converts to carbon dioxide when oxygen is present and methane when it is not (two greenhouse gases), through respiration of plants and animals, the oxidation of carbon through burning fossil fuels, (another hydrocarbon), heating limestone (calcium carbonate) to make cement, and volcanoes. This complex web of interactions and more is all part of what’s known as The Carbon Cycle, which Tom Harris has obviously either never heard of or is willfully hiding from his readers. Dishonesty or ignorance, I leave it to you to decide which reason to dismiss this brain stem of a human being. Even the “greenhouse effect” is misleading since the Earth’s atmosphere does not behave like a greenhouse. Greenhouses use a solid barrier (the glass roof) to prevent heat loss by convection yet, lacking such a barrier, convection accounts for about half the heat loss from Earth’s surface. He’s right. The analogy is incorrect, the gas does not act as a barrier in the way it prevents the thermal energy from radiating into space, but more like a sponge, soaking up more thermal energy and preventing it from radiating into space. scientists from the early 1800s should hang their heads in embarrassment. If they… you know… weren’t all dead and stuff. Harris is absolutely correct about one thing, the words we use to frame our arguments are very important, and we should be skeptical when a representative from a Canadian Organization bent on preventing action on Environmental Issues, calling themselves the Natural Resources Stewardship Project, makes such pathetic attempts to take others to task for their use of language. This extremely well-researched talk given by Naomi Oreskes and posted to Scientific American is generating some discussion online, and should generate much more. It reveals in detail how the same people have used the exact same rhetoric over and over again to prevent political action on a multitude of scientific issues where there was a strong, broad consensus. Frank Luntz 2003 Memo to Republican Candidates urged them to use the phrase “climate change” vice “global warming,” because the former was much less frightening. Scientists knew as far back as 1896 with Svante Arrhenius that human CO2 emissions were warming the globe. The political tactic of manufacturing a fake debate to dispute the scientific consensus on Global Warming has been previously used to dispute scientific criticisms of the Strategic Defense Initiative (Star Wars), the consensus that sulfur and nitrogen emissions cause acid rain, the consensus that CFCs cause the hole in the ozone layer, the consensus that cigarette smoking causes cancer, and that Environmental Tobacco smoke causes cancer. This coercive recycling structure is set up in layers, where the consumer (“producer” of waste) gets to do most of the work of sorting, cleaning, and transporting the trash to collection centers. Government-appointed companies then empty the containers and transport the materials to regional centers where the trash is prepared for recycling. And then everything is transported to centralized recycling plants where the materials are prepared for reuse or burning. Finally what is left of the materials is sold to companies and individuals at subsidized prices so that they can make “environmentally friendly” choices. So personal responsibility equals socialism, because the government is making Swedes assume responsibility. This leaves full-service government waste management or government-sponsored market-incentives (ie. tax cuts) as the only alternatives. How either of these alternatives is somehow less socialist I leave to the reader to muddle out. Bylund’s point is that recycling is a costly waste of time and does not actually save energy or resources. Following similar logic in 2002, New York City gave up recycling to save money, only to quickly reinstitute the practice and expand it dramatically. Why? Because recycling saves money, energy, and resources. Extracting metals from ore, in particular, is extremely energy-intensive. Recycling aluminium, for example, can reduce energy consumption by as much as 95%. Savings for other materials are lower but still substantial: about 70% for plastics, 60% for steel, 40% for paper and 30% for glass. Recycling also reduces emissions of pollutants that can cause smog, acid rain and the contamination of waterways. Is mandatory recycling unfair? Is personal responsibility unfair? Why should everyone who recycles have to pay for the landfill space of people who don’t have the aptitude or motivation to sort their waste into different containers? Waitaminute! Why the heck are Swedes still sorting their recyclables anyways?!?! Really, what Bylund is complaining about is the inefficiency of the Swedish mandatory recycling system, and that’s all he’s complaining about. In America, we have overcome this sorting hurdle by giving citizens two great big bins, one for recyclables, one for everything else, and let machines sort it out at the plant, in a process known as single-stream recycling, perhaps Bylund should argue for modernizing the Swedish recycling system instead of arguing for recidivism. That is, unless sorting trash into two bins is still too complicated for Swedes. Dittoheads love it when politicians make this sort of innocent mistake, and with such a famine of scientific data to support their skepticism of Global Warming, they are all ready jumping all over this statement as if it were the only news on the issue in months. In fact, the Drudge Report has given it one of it’s top headline spots, so we can just imagine all the Dittoheads dancing naked around a stone-monument to Rush Limbaugh tonight (Not a carved monument, just an ordinary rock, as all semi-round amorphous lumpy rocks look like Rush Limbaugh), jiggling and chanting “Ooga-Booga! Ooga-Booga! Ooga-Booga!“–on second thought, don’t imagine that. It’s gross. While his overall points were valid and Bloomberg’s one extreme statement was not technically untrue, it did venture to far into the uncertain realm of speculation. We don’t know how the Earth is going to ultimately react to a long-term and sustained build up of greenhouse emissions. Is it possible that our planet could experience the runaway greenhouse effect that gives our cosmic neighbor, Venus, its sulfuric rain and semi-molten rock surface? Hypothetically, yes, but we lack the data to see that far into the future. In his book Storm World Chris Mooney points out that it was inaccurate for AGW proponents to blame hurricane Katrina on Global Warming. Hurricanes of such strength will happen regardless of Climate Change. What Global Warming will do is increase the frequency of such powerful storms. This is the tightwalk of articulating the Global Warming threat that science-minded people must navigate. While Dittoheads can say whatever unsupportable inane thing that comes into their heads, we have the responsibility to provide the clearest understanding of scientific issues we have available to us at the time. It’s hard to imagine humans not surviving Global Warming, we are amazingly adaptable, and we will innovate our way through the challenges Climate Change will bring. It’s incredible what we can achieve when we pull together for a common purpose. E Pluribus Unum, after all. But the issue here is why should it have to come to that? Why should the human race incur the unimaginable expenses of time and resources it will take to engineer protections against a changing climate that’s our own fault? Why not simply choose to change our behaviors and preempt the whole thing so we aren’t forced into changing our behaviors by having to build levees against rising sea levels, pest-control for the ticks and killer bees that will thrive, changing the crops and livestock we farm as gardening zones move toward the poles, and all the unexpected consequences this will set in motion… all this and then having to innovate into a non carbon-based energy society anyway in order to keep things from getting even worse?